Guitar, strap, tuner and and comprehensive instructional guide all in one package. 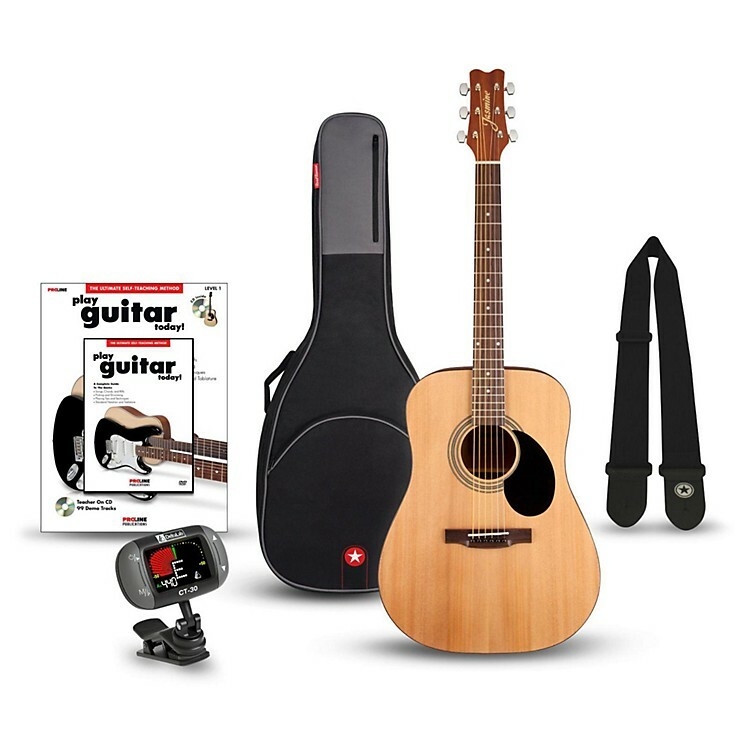 This bundle includes the Jasmine S-35 guitar, plus Road Runner's RR1AG Avenue Series guitar gig bag, Road Runner Soft Cotton Webbing guitar strap, DeltaLab's CT-30 clip-on tuner, and Proline Play Guitar Today!(Book/DVD). The Jasmine S-35 is a great-looking dreadnought guitar with a big, bold sound and excellent features ideal for any player seeking a well-built and easy-playing guitar. The S-35 features a select spruce top with Jasmine's Advanced "X" Bracing, and agathis back and sides. Its slim neck and full 25-1/2 in. scale length provide comfortable feel and excellent playability, and its smooth satin finish maximizes resonance for optimal sound quality. Get started today with this fun bundle. Order now.